"A thrilling tale of two worlds colliding in unexpected and exciting ways. The author skillfully weaves stories of the Greene family members with angels and spirits that come from unknown places. The character development is exceptionally strong, the plot is delightfully intriguing, and the ending is hopeful and inspiring. Highly recommended!" The Columbia Review. “Minimize” is the second book in the “Stones of Bothynus” Trilogy by D.K. Reed, a young adult fantasy series that combines supernatural romance with the intrigue of mystical realism. In this series, the reader follows members of the Greene family, who experience captivating adventures and mysteries that result from their missing Uncle Alistair’s research on three ancient stone artifacts. The second of Uncle Alistair’s stones (fittingly, the focus of the series’ second book) can change the size of molecules and alter people’s physical and psychological states. In these altered states, communication between different worlds can take place. 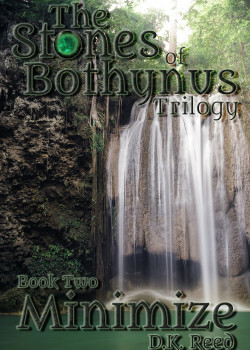 The deeply engaging characters, which were introduced in the series’ first book, “Snap To Grid,” are back in full force in this second installment of the Bothynus Trilogy. In “Minimize,” the Greene family continues to confront their inner demons as well as powerful spiritual forces pursuing the stones. “Minimize” delightfully highlights the story of Annie, a bold, compassionate fifteen-year-old girl, who is much too curious for her own good. Annie finds herself in curious situations after she “borrows” a device that her missing Uncle Alistair had brilliantly crafted from artifact dust. The dust effectively shrinks Annie and allows her to explore a hidden cave that’s located on her grandmother’s Smoky Mountain farm. It is in this cave that Annie glimpses an angelic being and ancient writings on the cave wall. Annie works feverishly to decipher some of these writings and is intrigued to discover that they reveal a half-angel’s world of pain and strength. The reader also follows the story of Aaan, the angelic being that Annie viewed in the cave. Through no fault of his own, Aaan is trapped in an ethereal form and is never sure when he will be reincarnated or able to move on in the afterlife. Annie’s appearance in his hidden world gives him pleasure and makes him smile. In fact, her visit is so unexpected and enjoyable that he begins to awaken from his enduring state of dormancy and hopelessness. Annie’s discoveries in the hidden cave prove that the Greene family is fighting more than flesh and blood. Further, Annie’s instinct and logic tell her that this ethereal cave inhabitant maybe Uncle Alistair’s only hope. But how long will this angelic being stick around? And just how will he be able to help? “Minimize” is a thrilling tale of two worlds colliding in unexpected and exciting ways. The author skillfully weaves stories of the Greene family members with angels and spirits that come from unknown places. The character development is exceptionally strong, the plot is delightfully intriguing, and the ending is hopeful and inspiring. Highly recommended!